« To Talk or Not to Talk? JANE: Although David Bowie may be the big name rocker best known for using SF/F material in his works, he’s certainly not alone. Both Fantasy and SF show up in the works of a wide variety of bands. I’ve thought of several. I bet you’ll have more to add. Tolkien’s “Lord of the Rings” proved a popular inspiration for several bands. Mountain’s song, “King’s Chorale,” is one example. Led Zepplin’s “The Battle of Evermore” and “Ramble On” both refer to motifs from the novels. Styx’s “Lord of the Rings” makes one of the most obvious connections, although the actual lyrics seem a bit at odds with the content of the novels. JANE: That sounds like something to inspire you through your daily chores! My list includes various pieces by Jefferson Airplane and its later incarnations, Jefferson Starship and Starship. Paul Kantner was an SF reader and often returns to the motif that the best way for humanity to change and thrive would be to get on a starship and head out for new planets where, presumably, it would be easier to create a new society without all the baggage of the old. A song that made a lot more sense to me once I listened to it with a “spec fic” mindset was Blue Oyster Cult’s popular “Don’t Fear the Reaper.” Ignore the “grim reaper” idea and substitute a tale of a vampire and his human lover and suddenly all the images fall into place. Okay… I’ve babbled enough. Your turn! ALAN: Of course, I’m a little bit older than you and so my memories go back further in time than yours do. I remember that there were several rock and roll songs in the 1950s that played with SF, though in a much cruder manner than the more sophisticated examples you cite. 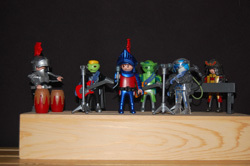 The Ran Dells had a big hit with “The Martian Hop” and, in England, Don Lang and His Frantic Five used the Martian theme again in “Red Planet Rock”. And who could ever forget Sheb Wooley’s “Purple People Eater”? JANE: I remember “Purple People Eater,” but I don’t think I’ve heard any of those others… But then I didn’t start listening to popular music until some twenty years later and these weren’t exactly Top 40 material at that time! For me the most important musical connection to SF will always be Jeff Wayne’s adaption of H. G. Well’s War of the Worlds. I think it’s just sublime and I’ve listened to it times without number. Not only is it a lovely piece of music in its own right, I think it perfectly captures the mood and the tone of Wells’ classic novel. JANE: I’m not familiar with that album at all. You say “adaptation”? Is it something along the lines of a rock opera? The songs and the music are truly inspired! JANE: That sound really good. I think I need to see if I can find a copy. Thanks for mentioning it. ALAN: One last example – I’m also quite fond of Hawkwind – a band whose music has always had a science fictional feel to it. Michael Moorcock wrote several songs for them, and their album The Chronicle of the Black Sword is a musical adaption of Moorcock’s Elric stories. I saw Hawkwind play the entire Black Sword sequence live at the World Science Fiction Convention in England in 1987. JANE: And, of course, the band’s name “Hawkwind,” seems to have been taken directly from one of Moorcock’s characters… The protagonist of The Jewel in the Skull and other eternal champion novels. JANE: You’re absolutely right… My error! But I interrupt… Go on. ALAN: Moorcock himself, together with a group of friends who called themselves The Deep Fix made a very SF’nal album called At the New World’s Fair which I highly recommend. JANE: I think I need to see if there is a copy on my shelf… (I never know what I have; my library is a combination of three people’s libraries, plus I’ve been given an astonishing number of books.) It sounds like the right sort of horrible. Roger Zelazny introduced me to Hawkwind’s music. He was very proud of the fact that they had written a song based on his novel Damnation Alley. I’ve looked everywhere for my copy and I can’t find it. It’s actually really good – and very faithful to Roger’s story. If anyone is interested, I see that lyrics, music, and various performances are available on the web. Michael Moorcock is far from the only SF/F writer to delve into writing and performing music. In fact, the list is so long that I think we’d better save that for next time. This entry was posted on December 11, 2014 at 1:00 am and is filed under Thursday Tangents. You can follow any responses to this entry through the RSS 2.0 feed. You can leave a response, or trackback from your own site. Hmmm. I was thinking about Emma Bull and Steven Brust, both of whom are fantasy authors, and part of the folk band Cats Laughing out of Minneapolis. And I believe Neal Gaiman may have some musical connections too. Read the final line, my friend… We’re getting there. And it’s oddly nice to know I’m not the only person on the planet who read _In the Time of the Hawklords_ (the sequel, _Queens of Deliria_ is better. Still not a novel for the ages, though). A musical version of “War of the Worlds”… The mind boggles. Although I guess it shouldn’t, given that Broadway has offered musical versions of everything from Superman to Sherlock Holmes. It sounds like they tacked on “Edison’s Conquest of Mars” at the end. Sheb Wooley’s second career was in westerns (“Wagon Train,” “High Noon”) but, when he was at a film festival many years ago, everybody was talking with him about “Purple People Eater.” And this was a western film festival! I was contemplating my old favorite band–Oingo Boingo–and what I realized is that, while what they played sounded like science fiction or fantasy, most of it wasn’t. (well, there was “No Spill Blood” which was a riff on the Island of Dr. Moreau). What a letdown. As for Blue Oyster Cult, I seem to remember that they created an entire, alternative soundtrack for Heavy Metal. False memory on my part? Of course, if you want a SF-flavored song with a Kiwi connection, there’s always Weird Al’s “Foil”…after 1:20, that is. I think Peter’s comment above has something for you on Blue Oyster Cult! I have the Heavy Metal sound track, so I know Veteran of the Psychic Wars pretty well. The friend I got that tape from claimed that another one of BOC’s albums was originally supposed to have been the entire sound track for Heavy Metal, but the film went with the ensemble instead and used only one of their songs. I’m not a big BOC fan, so I don’t know if this is true. I was wondering if someone else did. I really enjoyed all these comments. I can’t believe I forgot “Zombie Jamboree”! Zombies are SO trendy right now!